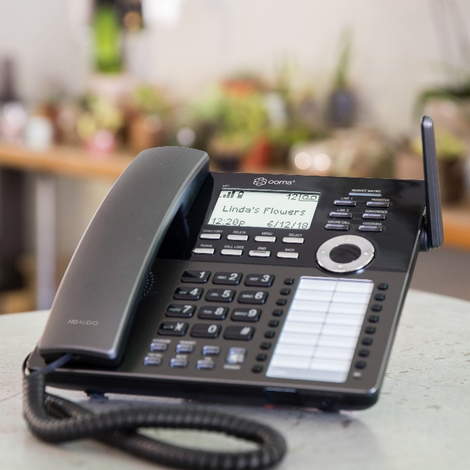 Ooma, Inc. (NYSE:OOMA), a smart communications platform for businesses and consumers, today announced the Ooma DP1 Wireless Desk Phone for its Ooma Office business customers and Ooma Telo residential customers. The DP1 is a fully featured two-line phone that can be placed wherever it’s needed without requiring a nearby phone jack. The DP1 for Ooma Office (https://www.ooma.com/office/ooma-dp1-wireless-desk-phone/) or Ooma Telo (https://www.ooma.com/telo/wireless-home-phone/) pairs wirelessly with an Ooma base station using the Digital Enhanced Cordless Telecommunications (DECT 6.0) protocol for a reliable connection at a range of up to 150 feet. Ooma Office (www.ooma.com/office/) gives small and mid-sized businesses a “big company” phone system with advanced features including a virtual receptionist, ring groups, virtual fax, audio conferencing and a mobile app for staying connected while on the road. The cloud-based Ooma Office platform requires no service contracts and works with a company’s existing analog phones and fax machines, as well as Ooma-provisioned IP phones. Ooma Telo (www.ooma.com/telo/ provides unmatched voice quality in home phone service, with unlimited free domestic calling. Premium features include call blocking, call forwarding, and a second phone line and phone number. The Ooma Telo is also the gateway for the Ooma Home (www.ooma.com/home-security/) family of wireless security sensors. The Ooma DP1 is available now from Ooma.com with a manufacturer’s suggested retail price of $89.99 ($109.99 in Canada) for Ooma Office (shop small business phones) and Ooma Telo (https://www.ooma.com/telo/shop-home-phones/). The phone is also available now at Amazon.com, and is expected to be available soon from other select retailers.